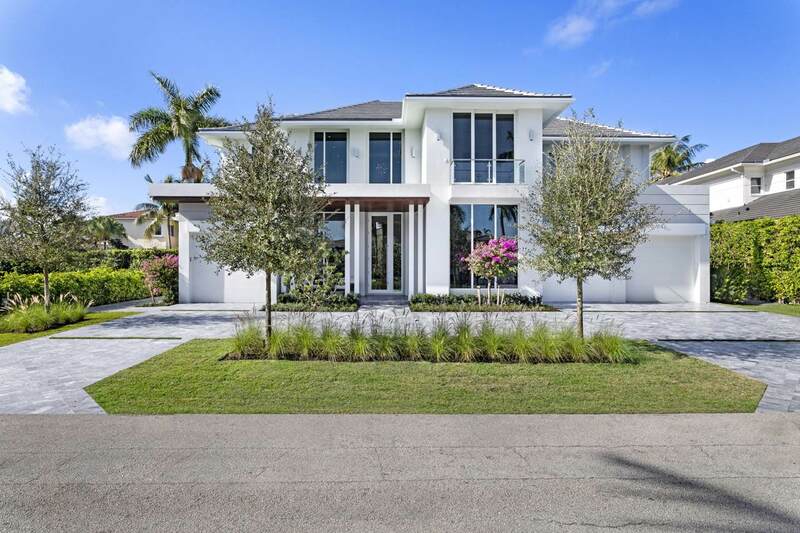 A new Coastal Contemporary masterpiece of everlasting appeal, this exceptional Royal Palm estate combines the integrity of Compson Associates with the creative vision of award-winning architect Randall Stofft. Indoor/outdoor living is expressed with style and ease in the comfortable open floor-plan - having a striking double-sided fireplace as its centerpiece - connecting through glass walls to the fire-lit lanai with summer kitchen by the saltwater pool.Other fabulous assets for entertaining range from the club/media room with bar to the glass-encased wine room and high-end chef's kitchen with Italian cabinetry, quartz counters, bar-height island, and Wolf and Sub-Zero appliances. The elevator, smart-house automation, generator, and impact glass add functionality and peace of mind. Porcelain tile floors refine the beautifully flowing layout totaling 8,159 square feet with five bedrooms, six and a-half baths, a three-bay garage, plus golf cart storage. Off the loft-style lounge upstairs, overlooking the two-story foyer, the exquisite and expansive master quarters have the luxury of a private terrace, morning bar, and two separate baths with companion wardrobe rooms. A guest master suite and versatile first-floor office/bedroom suite are additional features of this singular estate, scheduled for Fall 2019 completion. The written and verbal information provided including but not limited to prices, measurements, square footages, lot sizes, calculations and statistics have been obtained and conveyed from third parties such as the applicable Multiple Listing Service, public records as well as other sources. All information including that produced by the Sellers or Listing Company are subject to errors, omissions or changes without notice and should be independently verified by any prospect for the purchase of a Property. The Sellers and Listing Company expressly disclaim any warranty or representation regarding all information. Prospective purchasers' use of this or any written and verbal information is acknowledgement of this disclaimer and that Prospects shall perform their own due diligence. Prospective purchasers shall not rely on any written or verbal information provided when entering a contract for sale and purchase. Some affiliations may not be applicable to certain geographic areas. If your property is currently listed, please do not consider this a solicitation. In the event a Buyer defaults, no commission will be paid to either Broker on the Deposits retained by the Seller. "No Commissions Paid until Title Passes." Copyright 2018 Listing Company. All Rights Reserved.